Diamonds are the ultimate symbol of love. Since the middle ages, engagement rings have been given as a symbol of love and promise. However, it was only with the discovery of diamonds in the late nineteenth century that diamonds became the most popular option for engagement rings. Diamonds get their name from the Greek Adamas, meaning unconquerable and indestructible. Diamonds are the hardest substance on earth. They are resistant to scratching and can only be marked by other diamonds, which makes them ideal for daily wear. Not only are they very strong, but they also have a natural brilliance, making them appear sparkly and bright. 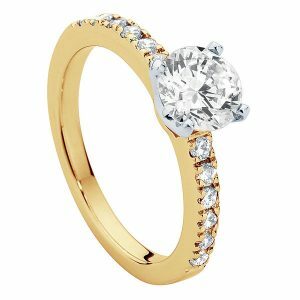 Diamond engagement rings are the most popular type of engagement rings, and with the variety of diamond cuts, sizes and shape combinations, the possibilities for a unique engagement ring design are endless. 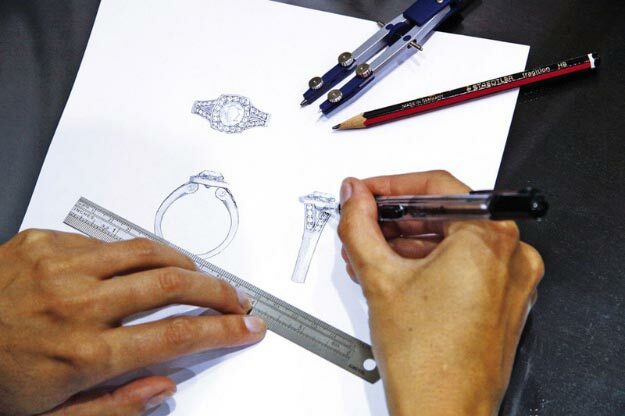 Larsen Jewellery specialises in custom made jewellery, including diamond engagement rings. As we make all of our rings to order, your choice of design is not limited to the selection shown above. Whether you want to choose from one of our classic styles or create something completely unique, Larsen Jewellery can make a diamond engagement ring to suit any style and budget. You can use our many display rings to help you choose a style, or alternatively, you can bring in your own ideas or pictures and our jewellers can help you design something special and truly unique. We welcome you to come in for an obligation-free design appointment with one of our jewellers who can advise you on choosing the perfect diamond ring. We can also help you understand the 4 C’s of diamonds to ensure that you make an informed decision when choosing your diamond.